We start by recalling previous work leading to an interpretation of fuzzy logic in terms of metric structures defined in a set of possible worlds. These possible worlds, or possible states of a system, are characterized by the truth values of clasical logical assertions about the state of the world. We consider next the nature of the information required to generate the underlying metrics, concluding that similarity measures are typically derived from preference relations that induce a generalized order in the space of possible worlds. 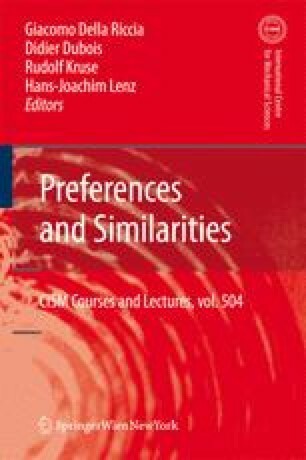 Recalling the relation between similarity measures and utility functions underlying several fundamental results such as the representation theorem of Valverde, we extend our similarity-based formalism by introduction of corresponding utilitarian notions, such as marginal preference and conditional preference. On the basis of these definitions we derive a formula to infer the value of marginal preference functions. Finally we briefly present several examples of the application of these ideas to the development of intelligent planners and controllers for robots and teams of robots. These examples motivate basic requirements for a comprehensive logic-based approach to a calculus of similarities and preferences. We note that logic-based preference formalisms permit to explicitly specify context-dependent formulas that tradeoff the relative utilities of attaining potential system states from the perspective of different preference criteria, allow specification of the interaction of individual agents, and control the behavior of groups of interacting agents.